You are here: Home / Glossary / What is: localhost? When you type in a browser the name of the website (aka xfpoint.com), the name resolves to an IP address. Using the IP address the browser communicates to the computer of the identified IP address to serve request. We can’t remember the ugly looking IP address and so we use a more friendly domain names. So if you wish to use the same computer from where you are generating the request to serve the request, the commonly used name for it is localhost. 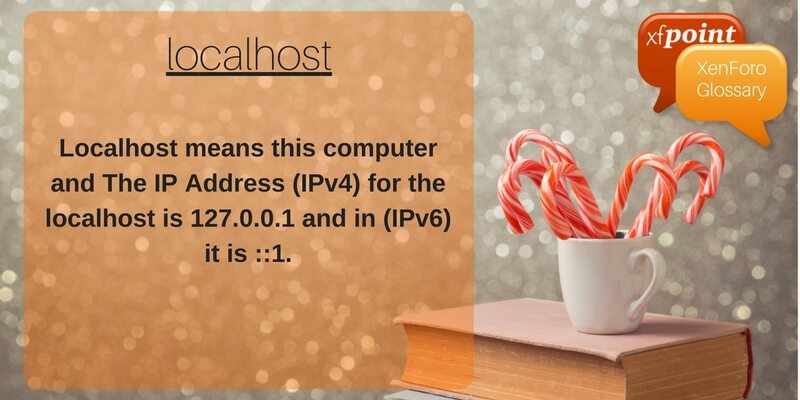 Localhost means this computer and The IP Address (IPv4) for the localhost is 127.0.0.1 and in (IPv6) it is ::1. You can access your local web server from a browser by typing either typing http://localhost/ or even http://127.0.0.1. Localhost is used for testing and development purpose where a developer can installs a web server on their personal computer and use http://localhost/ or even http://127.0.0.1 in their browser to pull up their XenForo website. Localhost works even without an active internet connection and can speed up the complete process of testing the code. Here is how one can setup complete XenForo site in localhost.